Several years ago I remember reading about the repo market for the first time. I had never heard of it before not because it didn’t exist, but because I’m not a financial guy and I had simply never paid much attention to how Wall Street banks fund themselves. To make a long story short, the repo market is basically a market for short-term loans. Really short term: it’s an overnight market, and if you have, say, $100 billion in repo funding, you have to roll over that funding every single day. If you can’t, you’re in big trouble. To a layman, that sounds crazy. Investment banks weren’t just using the repo market to gain a bit of additional flexibility, they were using it as a significant part of their funding base. They were literally dependent for their continued existence on a line of funding that had to be renewed daily. For concreteness, let’s use some names. Suppose the institutional investor is Fidelity, and Fidelity has $500 million in cash that will be used to buy securities, but not right now. Right now Fidelity wants a safe place to earn interest, but such that the money is available in case the opportunity for buying securities arises. Fidelity goes to Bear Stearns and “deposits” the $500 million overnight for interest. What makes this deposit safe? The safety comes from the collateral that Bear Stearns provides. Bear Stearns holds some asset?backed securities [with] a market value of $500 millions. These bonds are provided to Fidelity as collateral. Fidelity takes physical possession of these bonds. Since the transaction is overnight, Fidelity can get its money back the next morning, or it can agree to “roll” the trade. Fidelity earns, say, 3 percent. 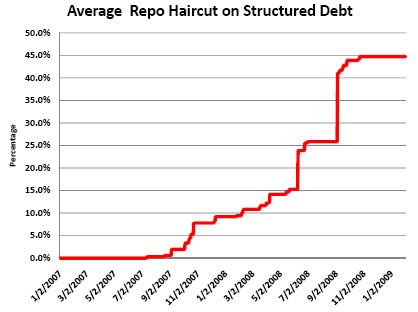 ….There’s another aspect to repo that is important: haircuts. In the repo example I gave above, Fidelity deposited $500 million of cash with Bear Stearns and received as collateral $500 million of bonds, valued at market value. Fidelity does not care if Bear Stearns becomes insolvent because Fidelity in that event can unilaterally terminate the transaction and sell the bonds to get the $500 million. That is, repo is not subject to Chapter 11 bankruptcy; it is excluded from this. Imagine that Fidelity said to Bear: “I will deposit only $400 million and I want $500 million (market value) of bonds as collateral.” This would be a 20 percent haircut. In this case Fidelity is protected against a $100 million decline in the value of the bonds, should Bear become insolvent and Fidelity want to sell the bonds. did not know which ground beef possibly contained the e?coli, there would be a panic: people would stop eating ground beef. If we all stop eating hamburgers for a month, or a year, it would be a big problem for McDonald’s, Burger King, Wendy’s and so on. They would go bankrupt. That’s what happened. The evidence is in the figure [on the right], which shows the increase in haircuts for securitized bonds (and other structured bonds) starting in August 2007. The figure is a picture of the banking panic. We don’t know how much was withdrawn because we don’t know the actual size of the repo market. But, to get a sense of the magnitudes, suppose the repo market was $12 trillion and that repo haircuts rose from zero to an average of 20 percent. Then the banking system would need to come up with $2 trillion, an impossible task. There’s more in the paper, which is worth reading if you want to learn more about this stuff. In my own mind, I have a tendency to waffle back and forth between blaming the economic meltdown solely on a single fundamental (housing prices crashed, everyone panicked) and blaming it on a variety of other factors as well (mortgage fraud, the growth of credit derivatives, ratings agency conflicts, massive abuse of leverage, wild underestimation of risk, etc.). Overall, I tend toward believing that although the housing crash was clearly both the proximate and primary cause of the collapse, all the other stuff really did matter too, magnifying an asset bust far beyond what it could have done on its own. Without massive leverage, for example, even a huge housing bubble couldn’t have caused the scale of the damage we saw.